Freesia (Freesia refracta): growing, planting, caring. A cousin of the Iris. Freesia is a genus of herbaceous perennial flowering plants in the family Iridaceae, native to the eastern side of southern Africa. The plants commonly known as "freesias" and grown as ornamental plants, with fragrant funnel-shaped flowers, are actually cultivated hybrids of a number of Freesia species. Freesia is a perennial with deciduous foliage that stocks its reserves in a "corm", which can be dug out from the soil and sheltered for the winter. Ribboned or lanceolate leaves are erect and fan-shaped at the base. These leaves look like the shape of iris leaves and daylily leaves. The flowers carry 3 petals and 3 sepals to form a funnel that can be pink, red, orange, yellow, or purple. These flowers are organized in clusters at the top of upright stems that gradually takes an horizontal axis. To plant freesias in the garden, wait for the temperatures to raise, a warm ground is a guarantee for a good development! Freesias dread full sun at noon, find them a sheltered spot. Plant your freesias in draining soil moderatly rich, in a hole 5 cm wide and deep. Mix some sand in heavy ground. Pour a small bed of gravel at the bottom of the planting hole, position your freesia tuber and cover it with soil. In case of late frost, protect the young shoots that emerge: accumulate soil all around them to shelter it from the cold. Indoors, plant in a mix of potting soil, earthsoil and sand on a bed of gravel. 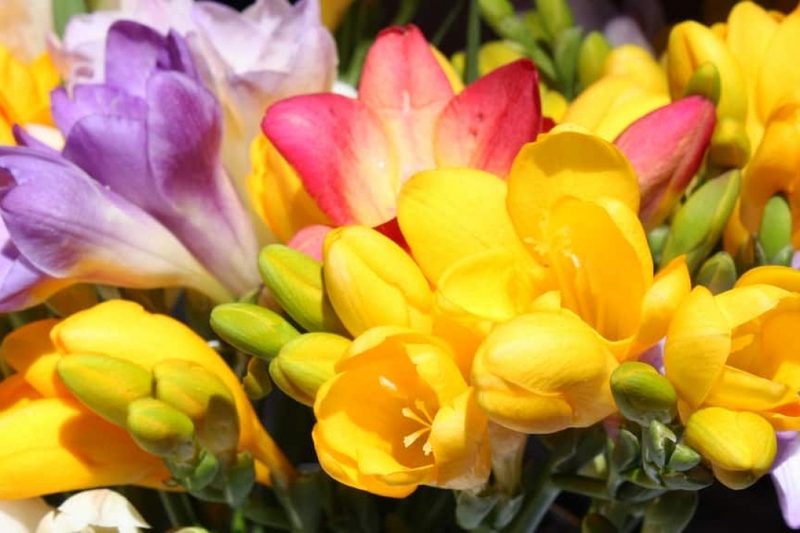 Do not install your freesia in an overheated room, to bloom it needs a temperature around 13 ° C.
Freesias do not need a lot of water, but water regularly after planting if it is dry, without soaking the foliage, it would favor the appearance of mushrooms. Indoors, in growing season water 1-2 times a week, to allow the top of the soil to dry on the between watering. When winter comes, gradually reduce watering until it stops completely: you will resume in the spring. In October-November, if the foliage blackens, cut the dry stems and dig up the corms. Clean them and remove the buds on the side of the corms. Store them in the dark, in a crate, in a cool, airy but not too humid room (temperature of 1 to 8 ° C). To avoid rotting, you can sprinkle wood ash on the tubers before storing them. If you've taken your tubers inside, bring them out when the weather is nice and replant them again! Wait until the temperature is mild and the soil is warm to ensure good growth! Plant your freesias in rich soil, worked to depth and area of 20 cm, and mix in a bit of compost. Pour one liter of water into the bottom of the planting hole, position your freesia, and cover it with 8 cm of soil. Insert your support stakes at the same time to avoid damaging the tubers. In case of a late freeze, cover the young, emerging shoots with mounds of earth to protect them. Build up the soil all around the base of the plant to shelter it from the cold. Do not install your freesia in an overheated room, to bloom it needs a temperature around 13 ° C.
Freesia is very voracious! It is important to bring organic fertilizer in late summer, in addition to a slow fertilizer. You can also fertilize in June, with compost or well decomposed manure, and eventually cover with a mulch. In pots, pour some liquid fertilizer every week during flowering.